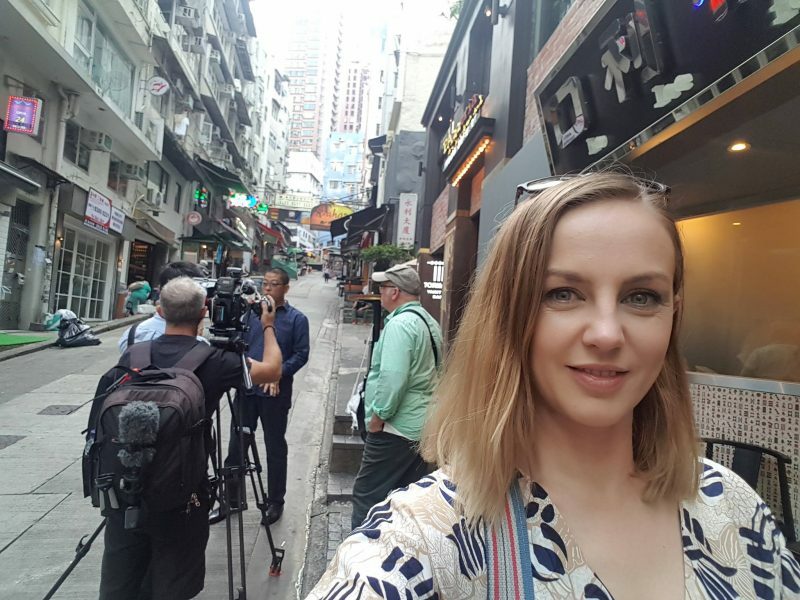 I guess it’s easy to feel perhaps a little smug about food and wine when you have grown up in one of the best wine regions of the world… But then you take your sheltered little self off to Hong Kong. After 6 days of the Hong Kong Wine & Dine Festival, restaurants, lunching with sommeliers and celebrity chefs, a private dinner in the owners box at the Hong Kong Jockey Club, wines from across the globe, local hot spots for breakfast, lunch, dinner… 2am chilli crab (ok, yes and the occasional Tsingtao) let’s just say I am thoroughly and spectacularly full… I mean, impressed! What has been most impressive has not been the vast array of choice, it is the ultimate international city, but the over-riding focus on quality throughout. Every single bite and sip has been a study in perfection. Some of the hands-down best food I have eaten was on this trip; sashimi, razor clams, roasted duck, chilli crab, and oh – the ribs! No decorum displayed here folks, I’m not ashamed to admit it – just the best kind of abandon-all-sensibilities, finger-licking event. Washed down with a delightfully crisp Rosé…Memorable to say the least. The ribs were from a remarkable place; Happy Valley Bar & Grill. Open to the street it’s the perfect spot to while away an afternoon, sipping, eating and people watching. I had the absolute pleasure of joining owner JR Robertson for lunch here. JR is one of the most down-to-earth, generous guys I have met, who just so happens to have the city’s food and wine culture in the palm of his hand. 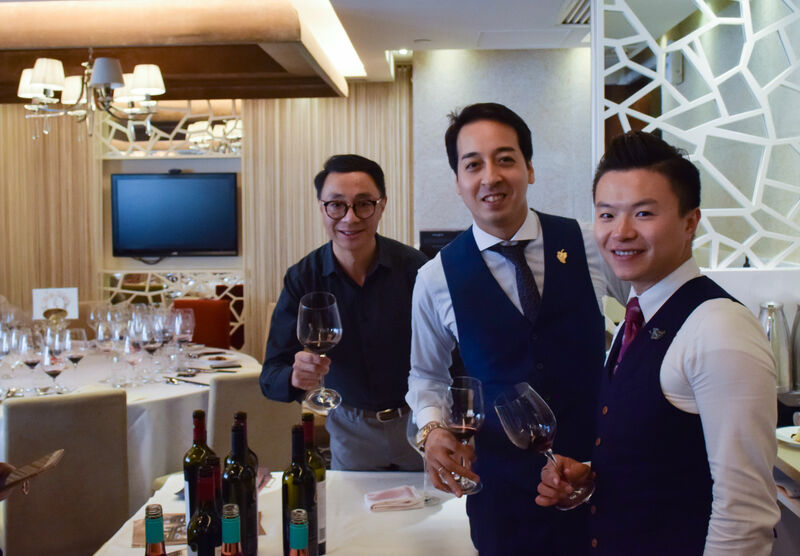 An American expat, JR has embraced Hong Kong’s insatiable thirst for quality wine and food since opening his first restaurant, Grappas in 1990. Grappas – and the personal dedication behind it- struck such a chord with the Hong Kong & now mainland Chinese public that JR has, at current count, 15 establishments in his group. Varying from bars to Italian to Mexican each displays JR’s focus on “great food, great drinks and exceptional service in a relaxed, casual environment” representing a fabulous snapshot of modern Hong Kong dining. Why all this focus so far on food? Simple. With premium food comes a natural partnership with fine wine. The wine culture here is booming – Hong Kong is a city that knows what it wants – and the wine list had better stack up. Something certainly not lost on JR, who also owns the beverage distribution company, Liquid Assets. Through their vibrant, international portfolio (including Aussies Dowie Doole and Mt Monster) and dynamic service they manage to “bring the feeling of authenticity and tradition (of the winery) a little closer to our home in Hong Kong.” From what I saw, the team at Liquid Assets do just that. They are the ultimate wine professionals, truly caring about the products – and the people behind them – in their portfolio. It’s exciting to see the passion our Aussie winemakers have for their products conveyed so vividly through others to the market. Their enthusiasm a reflection of the man behind it all and a vision for the future of the wine industry in the city. So, while I have dined I’ve been enjoying everything from Provencal Rosé to gloriously full-bodied Chablis and the best of our own country’s zippy, refreshing whites, fruit-forward Grenache, rosie-cheeked fizz and deep-of-the-earth Shiraz. All paired beautifully with the diverse and dedicated perfection that is the food scene here. A true reflection of just how well, in a few short years, wine has entwined itself into the Hong Kong lifestyle. 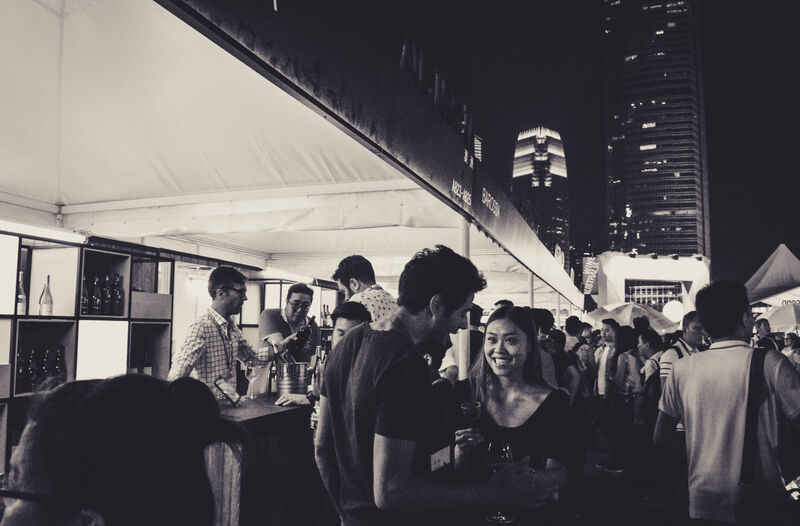 Some of the most fun, of course, was had at the staggering Hong Kong Wine & Dine Festival. The scale of this event was mind-boggling -hosting 400 wine and food booths, 2 exclusive pavilions, a stage and even a concept store. It was a joy exploring wine and food from across the globe, or hanging out, chatting and discovering wines of neighbours and friends from across Australia including those from my home town, the Barossa Valley, and even jumping behind the bench to pour some of my own favourites. Admittedly I am still a little baffled by the willingness of people in 35º midday heat to drink full-bodied Shiraz, but the smiles on their faces told me all I needed to know. 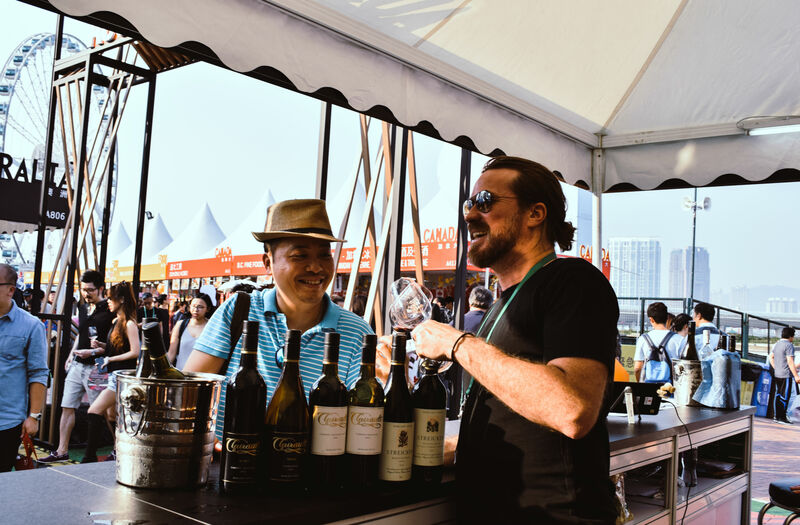 Australian wines have a place in the heart of Hong Kong and will be increasingly found in their glasses for years to come. Australia, we just need to keep it coming! An afternoon was spent wandering, lost, around the streets of Sheung Wan after a behind-the-scenes filming experience with the crew from Chef Exchange. 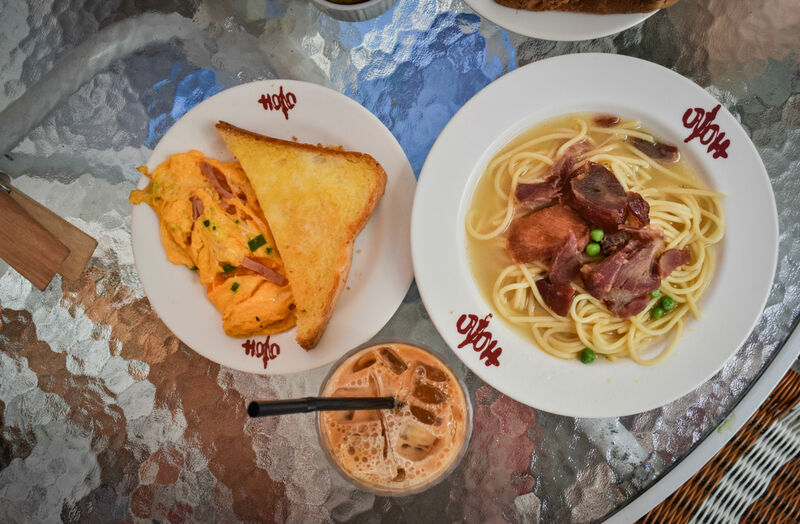 Simply relishing in the district which sees street vendors, traditional letterpress printing houses, hip new restaurants, French bistros, Dutch cheese specialists, luxury fashion houses, wine merchants, hole-in-the-wall bars & traditional Chinese medicine purveyors standing side by side. This was Hong Kong for me. Crazy. Crowded. Friendly. Beautiful. In the midst of all this, sitting in a coffee house I got chatting to an American UX designer. Explaining my trip I caught myself, realising just how ridiculous it all sounded, too-good-to-be-true. Like something you make up when really you’re tagging onto Great-Aunt Mavis’ bingo trip. Pinch me. It was true. Did it really have to end? There’s so much more to explore in this wondrous fantasy land of food and wine. Thank you Wine Communicators and PIRSA for the trip of a lifetime. Hong Kong, I’ll be back! Happy Valley Bar & Grill BBQ ribs, casual favourites. Cracking wine & craft beer selection. Ho Lee Fook Modern Cantonese. The meneki-naeko entry is seriously cool – but you have to try their roast selections – goose, suckling pig, crispy skinned chicken… oh my! Dragon King Restaurant Michelin recommended, fine-dining Chinese. Under the Bridge Spicy Crab Late night eats. Chilli crab served under a delicious pile of fried garlic and chilli. Hilarious wait staff to boot! Yaki ANA Japanese. Sensational sashimi. Don’t let the shopping centre location put you off! – World Trade Centre, Causeway Bay. Café Match Box Quirky, local café with a retro edge, complete with outdoor ping-pong table & great breakfast.